University Heights: Clark Hall- Fitness in the Heights! Clark Hall, located on UB’s South Campus, provides UB and University Heights with an extensive fitness and recreation center. 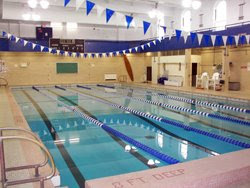 The amenities provided include 3 full-court basketball courts, 3 volleyball courts, 3 badminton courts, a multipurpose gym with tartan surface, a dance studio with a wooden floor, 3 racquetball/squash courts, a wrestling room, a weight room, an abs/cardio room, showers, locker room, and a 25 meter swimming pool for the full-body workout. The Fitness Center at Clark Hall features Nautilus and Cybex selectorized equipment for the person desiring this type of workout. In addition, the Clark facility is fitted with a Heartline Jungle Gym, free weights, benches and a variety of cardiovascular equipment. Using Clark’s facilities is more affordable than most health clubs, with only a $20 monthly, or $189 yearly fee for University Heights neighbors and other community members. This price also includes access to the facilities on North Campus’ Alumni Arena. Various programs and training classes are also offered for an additional fee. Visit Clark Hall today to begin a healthier, more active life! Valuable offers aren’t always overpriced. At 24 Hour Fitness promo code no initiation fee , it’s you who comes first. Using the provided promo code, you not only gain a major concession rather you can also get your initiation fee waived. Yes, absolutely! Come to the club, enjoy the exercise, make it a habit and enjoy your fun life style. Make yourself a regular participant and get the promo code right now! Really great and awesome article you write. We always needed that kind of help. I think you keep writting for us who need fitnesss tips as well as best solution for fitness equipment . Keep up the great work. I found a site like you and hope that you will also like it. $20 per month? $189 yearly? That's insanely cheap. I really like the way these people are promoting fitness and sports by providing amenities at such a cheap cost. Nice post and thanks for gathering good information. It can be helpful to all. Find the best Fitness Deals Near you in Australia and Compare Gym membership prices and get great fitness deals to keep you fit and healthy. I likd this blog very informative post shared by you. Fitness center and gym in Hyderabad Their workout space is spacious and trainers are good friendly and helpful. Solitaire fitness offers a body building, weight loss, toning/adding muscles many more forms of exercises to chose from.